Extensions (also called addons, plugins) are commonly available for Internet Explorer, Firefox and Google Chrome web browsers. Extensions provide easy way to extend browser functionality and provide more options for user customization. Apple has launched Safari Developer program with listing of tool and resources to easily develop free extensions for Safari browser integrating any product or functionality concept. Lot of free Safari extensions should emerge very soon and following is the procedure to manage them in Safari browser. 1. Launch Safari browser (make sure you have Safari 5 or above, you can download latest version from apple.com/safari). 2. Goto Edit > Preference and click “Advanced” tab. 3. Click to select (tick) “Show develop menu in menu bar” option. 4. 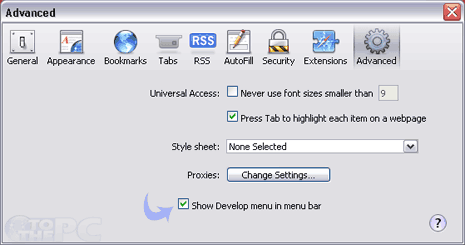 Then goto Develop menu option and click “Enable Extensions”. 5. To manage, view and update Safari Extensions: goto Edit > Preferences and then click “Extensions” tab on the settings window. Once you have enabled Extensions menu in Safari browser, you can download free Safari extensions and further install Safari extensions for quick use.